First of all, health = happiness. 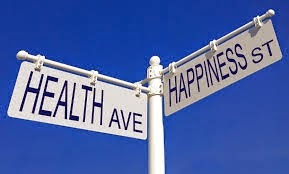 Or at least bad health = unhappiness. Therefore: safeguarding our personal health reigns supreme among life's priorities. I don't mean that selfish regard for our own person trumps all other concerns, such as caring for our children, our aged parents, or others who need us. But it should be evident that if the caregiver isn't well, the care given won't be adequate. Okay so then, what are the keys to health (among the things that we can control or at least affect)? SLEEP WELL. Hard to do? Yes but it's so important! My best advice about how to get sweet, restorative sleep happens to be another key to good health, which is EXERCISE DAILY. While exercise is great for all kinds of outcomes -- such as weight control, stress relief, cardiovascular health and preventing chronic diseases such as diabetes -- one of its less touted benefits is that you will fall asleep faster and sleep more restfully if you exercise to the point of sweating for at least a half hour each day. And what else? Here's where the healthy foodie comes in. EAT WELL! That means don't eat junk; eat nutritious food, and make sure your daily diet includes vegetables. Potatoes do not count! Green things, preferably. Learn to love broccoli or spinach or green beans. Finally, pay attention to your body and get all your recommended screening tests. That means having a dermatologist look you over (DON'T TAN!! ), getting regular mammograms (F) or prostate exams (M), and anything else that may apply to your personal situation. And then...enjoy life! Healthy Portland Food There are many reasons but here are the most important ones. Raw foods such as fruits and veggies, contain anti-oxidants which fight free radicals. Free radicals cause premature aging and health problems. Free radicals are found everywhere from pollution, to fried foods, to microwaving food, to radiation, smoke and so on. The anti-oxidants in raw foods, such as fruits and veggies help combat this damage and help you look younger. New Diet Taps into Revolutionary Idea to Help Dieters Get Rid Of 15 Pounds in Only 21 Days!